Julian Richard Morley Sands (born 4 January 1958) is an English actor. 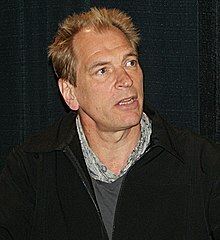 He is known for his roles in movies such as The Killing Fields, A Room with a View, Warlock, Arachnophobia, and Vatel. He is known for his roles in television series, such as Vladimir Bierko in 24, and Jor-El in Smallville. ↑ Births, Marriages & Deaths Index of England & Wales, 1916-2005; accessed 4 May 2014. This page was last changed on 27 July 2018, at 20:29.